The abusive mentality is that of a profound sense of entitlement to power and control over others, and of a conscienceless justification for utilizing tactics to gain and maintain that power and control. Pastors, in the course of their ministries, will certainly come up against such abusers. A common, if not innate, quality of abuse is that of deception, facade, and camouflage — the wolf in sheep’s clothing if you will. And that means abusers will take on the guise of being a Christian, very frequently of being an eminent Christian in a local church. He may be a pastor or elder himself. How can pastors effectively deal with these “hidden reefs” who creep in among us in the church? First, and without doubt most importantly, pastors must take steps to correct their ignorance concerning the nature, mentality, tactics, and characteristics of this category of evil. The persistent, nagging deficit that is plaguing our churches is the pervasive lack of understanding of abuse. Great harm and injustice are being effected upon victims of abuse at the hands of the very church families that should be the chief protector of the widow, the orphan, and the weak. Abusers are masters at using all kinds of deceptive means to gain allies to their side in their oppression of the victim and we have many documented case histories to support this conclusion. 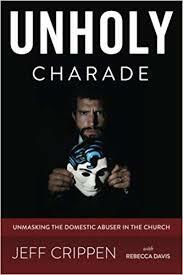 Unholy Charade:Unmasking the Domestic Abuser in the Church, by Jeff Crippen. This is the second book I wrote, telling the real stories of abuse victims and their abusers all of whom were (and are) hiding in churches. It is an excellent primer on the subject and will take you far in equipping you to wisely deal with this evil. Pastors will also learn how Diotrepehes (cf 3 John) type, power hungry, pastor-destroying people in churches operate. My first book, A Cry for Justice [*affiliate link] specifically examines abuse in the setting of the church, giving the reader insights into how abusers work their dark trade in the body of Christ. I learned the lessons recorded in this volume through hard and difficult years as a pastor. This Unholy Charade blog is another resource that provides an ever-increasing depository of articles on all aspects of abuse. It is proving to be a very effective resource for abuse victims and for anyone who desires to educate themselves in this field. This blog also has a resources page that lists other excellent tools for study. Should any pastor think that this subject is one that belongs only to the fields of psychology and counseling, and that pastors should devote all of their time to the study of Scripture alone, let me encourage you in this regard. When you study abuse, you are studying the very psychology of sin. All sin is lawlessness (1 John 3:4). Lawlessness is rebellion against the only One who is entitled to power and control, God Himself. It has been my conclusion from studying this subject of abuse that in it we see sin in one of its purest and most diabolic forms. And therefore I say to all pastors — if you would come to know the nature and mentality and tactics of the evil one, study abuse. The wisdom you will gain will be of huge benefit to you and you will find yourself suddenly able to connect the Scriptures with real life like never before. The Scripture is all sufficient. The thinking and tactics of abuse are set forth for us in God’s Word, but we so often lack wisdom and experience to grasp the full import and significance of what the Lord is telling us in His Word. This, then is the start. Admit that we have much to learn. Recognize that there is a potent, seductive, subtle evil operating in our midst under the radar of our detection, and that we desperately need, as shepherds of Christ’s people, to effect a full systems upgrade that will enable us to detect it, expose it, confront it, and set its captives free. We did not learn of these things in seminary. Before we can counsel anyone, we must first know and identify the problem or we will be like doctors prescribing potent medications without even trying to understand the affliction.